Prudence Designs invites you to experience the magic of unforgettable flowers. 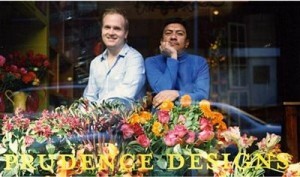 Ever since partners Grayson Handy and Arturo Quintero launched Prudence Designs in 1995, they’ve helped thousands of clients-including fashion designer Tracey Reese, actor Tom Cruise, comedian David Letterman and performer Sandra Bernhard bedeck their homes and events with gorgeous, one-of-a-kind floral arrangements. Named after their beloved dachshund, Prudence Designs features exquisite floral designs from a simple ‘Thank you’ arrangement to a full-scale event. Prudence is a favorite of the fashion and entertainment industries for their artistic vision. In 2003 and 2008, Citisearch.com named Prudence Designs Best Florist in New York City, both as audience and editorial winner. Prudence Designs was also rated Top Ten florists nationwide. The Knot has chosen Prudence Designs & Events for their Best of Weddings from 2007-present. Recently, Grayson Handy appeared on NBC’s LXTV for their Open House show. Their Tips of the Trade segment was televised on air, website, and in the back of 10,000 New York City taxis. He has also been a featured guest on Martha Stewart’s Living Sirius Radio Show. He has also worked with Dina Manzo (Housewives of New Jersey) on Dina’s Party for HGTV as a featured floral/design expert. He also writes for the Huffington Post’s Stylelist Home. Prudence was also featured on Regis & Kelly, the Today Show’s “Throw a Wedding”, Good Day New York and created Joy Behar’s “Fantasy Wedding” on The View. Their work has graced the pages of New York Magazine, Modern Bride, Bridal Guide, Brides, InStyle, The Knot, Elegant Bride, Time Out New York, Lucky, House & Garden, Costal Living, Martha Stewart Living, Cargo, Country Living Gardner, Victoria, Avenue, Us, Veranda, Gotham, Breathe, Absolute, New York Times, New York Post and New York Daily News. In addition to providing a full service floral business, Prudence features exclusive pottery, original artwork, pillows & throws, home furnishings and accessories, and vintage/antique furniture. Prudence Events, a full service event production company, was launched in 2000. Headquartered in New York City, Prudence Events is the invention of creative director Grayson Handy. Mr. Handy’s background also includes a successful visual career at Takashimaya, ABC Carpet & Home, and Barney’s New York, considered New York’s most exclusive retail destinations. In 2007, Arturo Quintero’s book Faux Florals-Arrangements for All Seasons was released. In October of 2009, Grayson Handy’s first book “Flowers for the Home-Influences from the World Over” was published by Rizzoli International. After its release in the United States, Flowers for the Home was later printed in German and Italian for the European market. It is currently in its second printing. The book was turned into an engagement calendar for 2011, selling out of the 4,000 copies printed in just two weeks. In 2012, another calendar was published for the Japanese market. Michael J. Fox & Tracy Pollan, Lupita Nyong’o, Tom Cruise, Michelle Pfeiffer, Rihanna, Jay-Z, Beyonce, Madonna, Brooke Shields, Katie Holmes, Christina Aguillera, Hilary Swank, Jennifer Tilley, Joy Behar, Kelly Ripa, Katie Couric, Patricia Velasquez, Ubah Hassan, Sandra Bernhard, Illeana Douglas, Faith Hill, Hugh Jackman, Patricia Field, Dina Manzo, Marci Klein, Patti Lupone, Debbie Harry, Mikhael Barishnokoff, Barbara Walters, Renee Fleming, Candice Bushnell, Candy Spelling, Jorge Posada, Rachael Ray, Robert Verdi, Timothy Hutton, Jude Law, James Wood, Kim Kardashian, Nicole “Snooki” Polizzi, David Letterman and Holly Hunter. Angel Sanchez, Marc Jacobs, Christian Louboutin , William Wegman, Cynthia Rowley, Carolina Herrera, Vera Wang, Michael Kors, Diane von Furstenberg, Shamina Talyarkhan, Rebecca Taylor, Elizabeth Bauer, Zac Posen, Nanette Lapore, Tricia Foley, Tracy Reese, Amsale, Diesel, New York & Company and Ralph Lauren. O Magazine, InStyle Magazine, Barney’s New York, Prada, Banana Republic, Liz Claiborne, 24 Seven Inc, Stila Cosmetics, Estee Lauder, Tractenberg & Co., LaForce + Stevens, BMG Entertainment, BET Network, Management + Artists, J. Walter Thompson, Diamond Information Center, DeBeers, amFAR, Institute of Culinary Education, Christofle, Conde Nast Publications, Cargo, GQ Magazine, The Horticultural Society, Tracy Paul & Company, Fresh Inc, American Australian Association, Gap, Victoria’s Secret, La Perla, DeBeers, Eileen Fisher, Wedgwood, Waterford, Coach, St John’s Knits, Cosmopolitan, EMI, Glamour, Cisneros Group, Cocoran Group, Bobbi Brown, Gourmet, Bon Appetit, Time Inc., J Crew, The MacDowell Colony, Chase Private Banking, Bank of America, Ziff Brothers, BlackRock Inc., Oliver Wyman, Honig Conte Porrino Insurance, Sally Hershberger Face Place, Ford Modeling Agency, Oreo, Union Square Events, JKS Events, Productions by Parker, SCM Hospitality, BMF Media, EVO Realty, Stevens & Lee/Griffin Company, Cointreau, GILT, NoMAD Hotel, The Four Seasons New York, El Museo Del Barrio, and Starr Restaurant Group’s Buddakan NYC, The Clocktower, El Vez, Caffe Storico & Morimoto Restaurants.